The 0.999 pure bullion Mexican Libertad, first minted in 1981, is one of the most commonly collected coins produced by the Mexican “Casa de la Moneda" – literally, the “Money House". Weighing 31.1 grams, and about 20% larger than the American Gold Eagle owing to the alloy which is added to strengthen the coin, this very desirable and collectable piece epitomises the quality and craftsmanship for which the Mexican Mint is famed for. Mexico boasts not only the first mint on the American continents but also the first in the Western Hemisphere, dating back to a 1535 charter in which the Spanish crown allowed the Viceroy of Spain to exploit the rich natural gold and silver resources of the newly acquired territory. The important historic context of Mexico's gold production adds numismatic value to the already valuable and very stable investment opportunity that is found in precious metals. The return of investment on gold coins is typically 50% over the first 3 years and as such offers an attractive opportunity for wealth diversification and a hedge against riskier investments – particularly necessary in the current global economic climate. The Mexican coat of arms is displayed as proudly on this coin as on the national flag. An eagle perched with one leg atop a prickly pear cactus while devouring a snake depicts the legend of the founding of Tenochtitlan – now Mexico City. After 300 years of searching, the nomadic Mexica tribe finally observed the sign described to them by their sun god Huitzilopochtli that would determine the location of their new and prosperous capital city. The words “Estados Unidos Mexicanos" are embossed above the image, to commemorate the end of the War of Independence and Mexico's transition from a republic to a confederation of states, which took place over 500 years after the Aztec capital was built. On the obverse, an equally powerful and suggestive image of the statue of the goddess Nike, known as Winged Victory, is flanked by 2 volcanoes. Iztaccíhuatl, the sleeping, white princess and Popocatépetl, the victorious warrior, embody the strong bond between the two unfortunate lovers from this folkloric tale from the state of Morelos and symbolise the enduring dedication of true love. As one of the oldest currencies in North America, the Mexican peso is the direct descendant of the eight piece issued by the Spanish government. The peso was accepted as far afield as China during the 19th century and was considered legal tender in the USA and Canada for at least half of that century. Mexico has a long history of minting high quality coinage due to the abundance of gold and silver that was exploited by the Spanish conquerors from the early 1500s. Minting of the Libertad began in 1981 as a replacement for the Onza, and 10 years later production began of fractional coins, namely the 1/2, 1/4, 1/10 and 1/20. 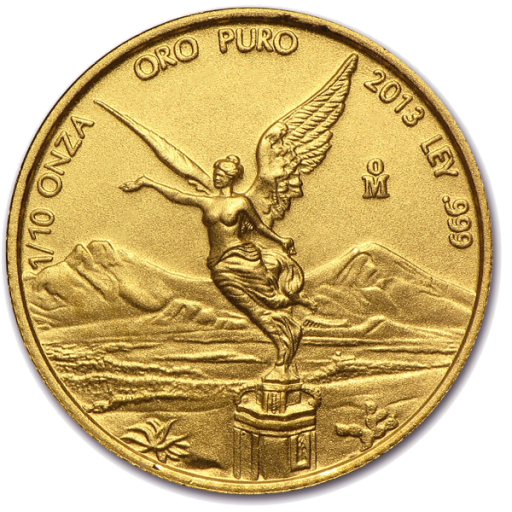 While the Libertad is considered legal tender in Mexico, it is minted without a face value and so if real value must be calculated based on the daily fluctuations of the price of gold. The quality and craftsmanship for which the Mexican mint is renowned mean that it is extremely rare for forges to counterfeit coins as ornate and well-made as the Mexican Libertad. What's more, the experts at CoinInvest are so confident in their experience that no attempt at counterfeiting such coins would be sufficient to mislead their judgement. When purchasing through CoinInvest, our customers can rest assured that our stringent appraisals remove the risk of buying anything other than the real thing. At CoinInvest, our team of expert staff is readily available to provide an offer should you be interested in buying or selling any quantity of Mexican Libertad gold coins. Please contact us to receive your personalised offer via phone or email. Should you wish to make your purchase online, simply update the fields to the right of the image at the top of the screen to let us know how many coins you would like to purchase, and add them to your shopping cart. Once you are satisfied your order is correct, click on the orange strip and proceed to checkout by following the on-screen instructions.